Sixteenth century portraiture is our key to understanding how Elizabethans wished to be perceived by their peers, subjects and descendants. Prosperous individuals and families often used portraits as a way of communicating wealth, morality and education to the public. Hence every detail, such as clothing, jewels, ornaments and even pets, is significant in a portrait. In practical terms, portraits were ideal because they could be displayed easily or even sent overseas to foreign lands, particularly miniatures. Henry VIII famously dispatched his artist, Hans Holbein the Younger, to Germany to produce a miniature portrait of his future bride, Anne of Cleves, in order to determine whether or not she was attractive enough to marry. Portraits were essential to the monarchy as a way of displaying power, leadership and prosperity to their subjects. Noble and middle-class families found portraits useful to communicate their stations and wealth to others. If you couldn’t afford to commission a portrait of yourself or family, it was considered respectable to own an image of a nobleman or woman, because it proved that you and your kin aspired to wealth and nobility. Materials used in portraiture varied according to artist preference and, crucially, financial means. Pigments depended on the availability and cost of materials, and the canvas itself could range from wooden panels to vellum or calf skin. This copy of the Cobbe portrait of William Shakespeare, supposedly the only one to have been painted during his lifetime, was made in 1615. It was previously known as the Ellenborough Portrait. Now, however, it is referred to as the Shakespeare Birthplace Trust Portrait. While we do not know the name of the artist, painter anonymity is often the case for paintings at this time. 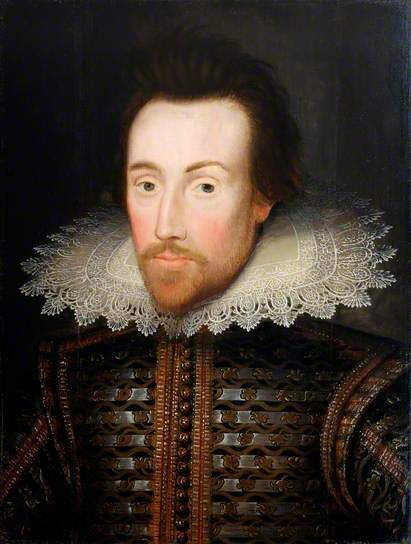 Consider how carefully the artist has painted Shakespeare’s face and clothes. His skin looks clear and his eyes look bright and alive. The beautiful lace collar was very fashionable and expensive, and shows us that, at this time in his life, Shakespeare was successful and wealthy. This portrait was painted on oak panels. The wood was left to ‘season’ or dry so that it would be in good condition for painting. The paints were made from pigments, or coloured earths, mixed with linseed oil. Would step from this to this? This entry was posted in 2014 Anniversary Exhibition and tagged Cobbe, Shakespeare. The Portrait is the most striking object for me. I love the colours and style. Thank you for explaining the significance of Elizabethan portraits! I will pay more attention next time I see one!